Belated Family Holidays and Island Dreams! Hope everyone has recovered from the festive season! For me its been a busy month or so. I have been working a lot in the central states – which is good for future travel plans later in the year – but sadly I am missing some great family moments back home, like the Palecek Family After Holiday Holiday Party. This year, because my family is large and growing, we decided to do a secret santa. I loved it! The holidays are expensive, I hate giving bad gifts and having to thoughtfully think about what to get twenty plus people will no doubt result in a bad gift. This way I can focus my energy on the one person and make something wonderful for them. I pulled my cousin Traci’s name from the drawing and my mind went completely blank, at first. What the heck am I gonna get for her?!? I love love love my cousin, but we have completely different taste on almost everything and she has all sorts of allergies and sensitivities to variety of materials that most people would not think about. Finally I decided that I would paint something for her. She bought her first house last year and the walls are still barren. I know she loves Hawaii, she visited years ago and dreams of returning someday soon. 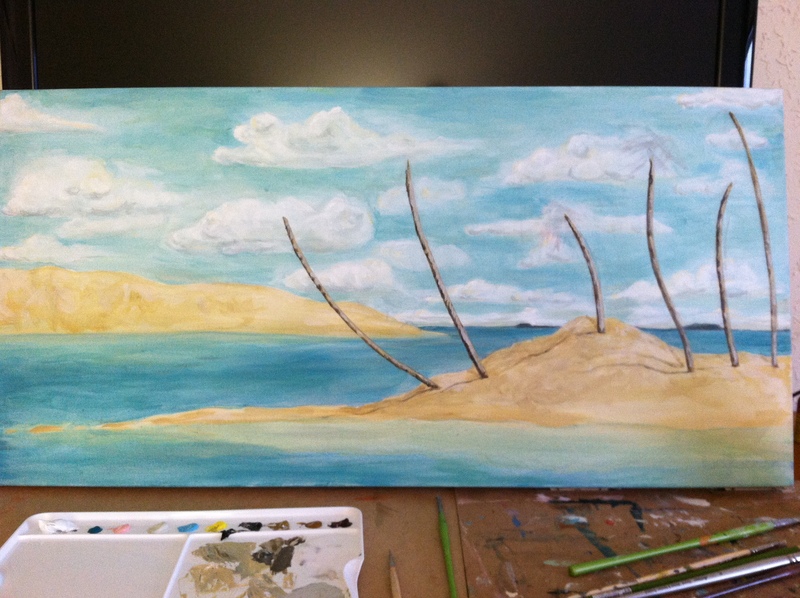 I didn’t paint her an actual landscape that could be found in Hawaii, but I created a simple island composition inspired by the millions of hawaiian beach landscapes photos I found on the internet. I finished the painting in about 10 days. I would have liked to have spent more time working on the details but I needed to get the painting completed in time to ship back to New Jersey for the family party today! Work has been busy and thus making it difficult to paint as much as I would like to, I was actually one of the few people thankful for the arctic freeze this week because it allowed me the time off from work to sit in my hotel room and paint. Shipping the piece was an even bigger adventure! First I tried the post office, but the canvas was an odd oversize item that would not fit any of the packages they had available. I thought I would be allowed to create a box from materials, but learned that everything that I would need to do to ship this painting was considered a felony by the USPS. I couldn’t even use liquor boxes to make a box!! Next was Fed Ex in the local office max. They too did not have the box size I needed, but they at least had materials for me to create a very ugly burrito style box loaded with packing tape on either end. People shopping for office supplies would walk by and LAUGH at me. To be honest I was laughing with them too! It was a pathetic looking box. I am sure I would have done better if I was allowed to use box cutters, but that was against store rules. I left actually worried that the package would not pass some kind of shipping code and get lost in the labyrinth of fed ex shipping trails. If you like what you see please visit my Etsy Shop PaleChick Studios! I am still not prepared to post about my magnificent trip to Alaska this past Spring. There are so many notes to look through and photos that still to be work on, but I did come across one of the postcards I painted while aboard the Columbia on the Alaskan Marine Highway that I wanted to share. I painted a few postcards while on the ship, but, before I was smart enough to photograph any of them, fellow passengers took a genuine liking to my work and asked if they could buy them. Feeling a bit generous I opt to give them away for free. Originally I had planned to paint my own postcards throughout the trip and mail them home to friends and family, but there was so much going on that I never actually found the time to stop, sit and paint as I had fantasized. It was a lot of work to keep up with my travel journal on a daily basis, let alone paint the landscape. When my fellow passengers sincerely wanted to mail my Alaskan landscape watercolor sketches to their family I was more than happy to just give them the postcard. I did, however, get some good conversation in exchange and a reason beyond my personal enjoyment to paint some more. One of my recipients was a young girl about the age of 13. She came from a large family of twleve kids and they would travel the country singing bluegrassy hymns at various fairs across the states. Her birthday was our final day on the ferry so I gave her not only a postcard I painted but a book of blank postcards for her to paint as well. Another recipient was a woman from a group of people who came up to enjoy our 8th deck scenery. She was a bit intoxicated but affable. She and I had a enjoyable conversation about Alaska’s scenery and what we will miss most about the great state. She had forgotten to buy postcards for her family and wanted to mail mine if I would sell it to her. The idea of my artwork traveling through the mail was good enough for me! The final recipient was a guy that I had a bit of a crush on through out the ferry passage. It took me several days to finally muster up the courage to speak with him and I had the brilliant idea of giving him my favorite postcard with my contact info on it.. too forward?? lol I hope not. no word from him yet, but who knows. I don’t remember where the ship exactly was when I sketched this scene. 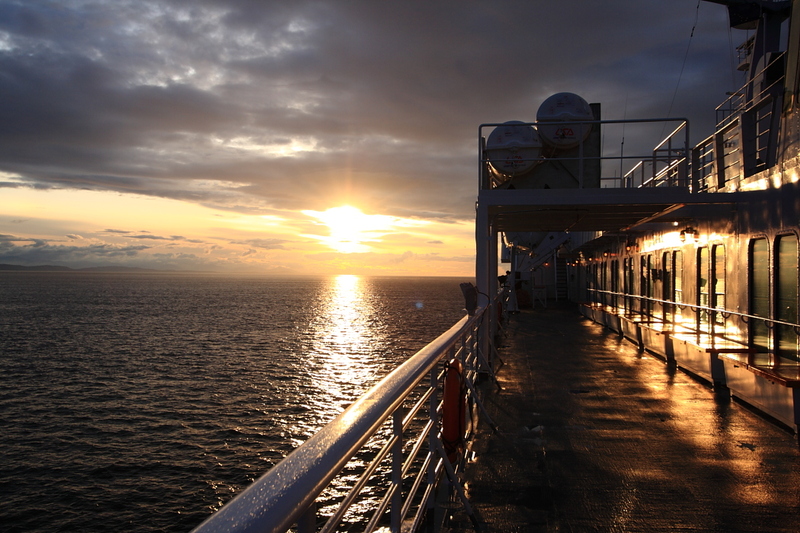 I am suspecting, judging by the bright yellowing sunset, that we were between Juneau and Ketchikan when the days were still incredibly long. I sat on the 8th deck of the Columbia, admiring the passing mountains and islands covered with evergreens, felt inspired by the brilliant colors and jovial mood of the deck. It was a challenge to sit and paint with the wind whipping around. A few times I had to chase after my little paper cup of water before it blew into the water. Hong Chun Zhang was born in the Shenyang, China and currently resides in Kansas. 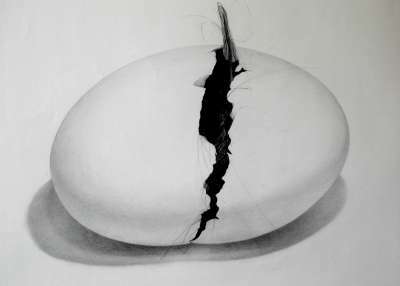 Zhang grew up within an artistic family. Both of her parents were art professors and her two sisters are also successful artists. Zhang began her artistic studies with her twin sister, Bo, at a young age and both girls attended the high school attached to the Central Academy of Fine Arts in Beijing. In 1996 Zhang moved to the United States to continue her education at the University of California in Davis, CA. She has remained in the United States ever since. Two thought provoking series, “Three Generations” and “The Long Hair”, has been bringing her plenty of recent attention and success in the art world. “The long Hair” series are divided into two categories. 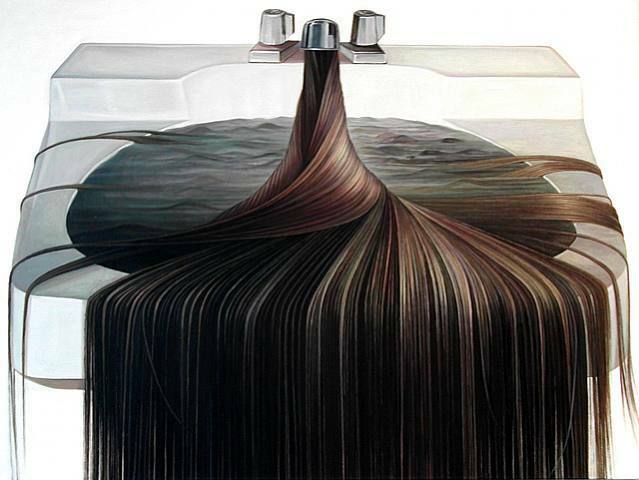 One is a series of beautiful and impeccable charcoal drawings of long gorgeous black hair. The drawings are larger than life in size and the image of hair very appealing. 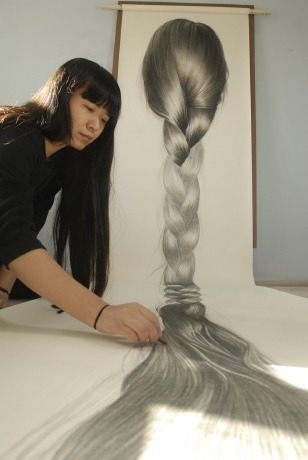 The drawings are hair portraits of Zhang and of her sisters. 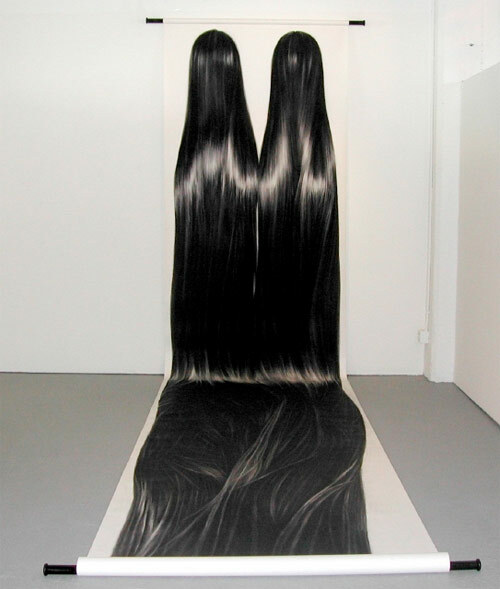 The drawings represent the connection between hair and culture, between her and her sisters, and the beauty of long hair. From a distance they appear to be photographic it is not until you come closer that you can appreciate and see the charming detail of charcoal. The images are drawn on large paper scroll, another connection to her creative heritage. The other category of the “Long Hair” series focuses more on the repulsive side of hair, another cultural connection we have with hair, with a bit a sense of humor. Hair is seen as being beautiful when it is clean and existing only where we want it to. When an individual comes across a strand of hair in his or her food, clogging a sink, or on the floor it becomes something that is repulsive and unappealing. With the portrait series titled “Three Generations” Zhang focuses her attention on the connections with her mother and with her grandmother. The portraits depict the individual and generational connection each of the women have with their Chinese culture. 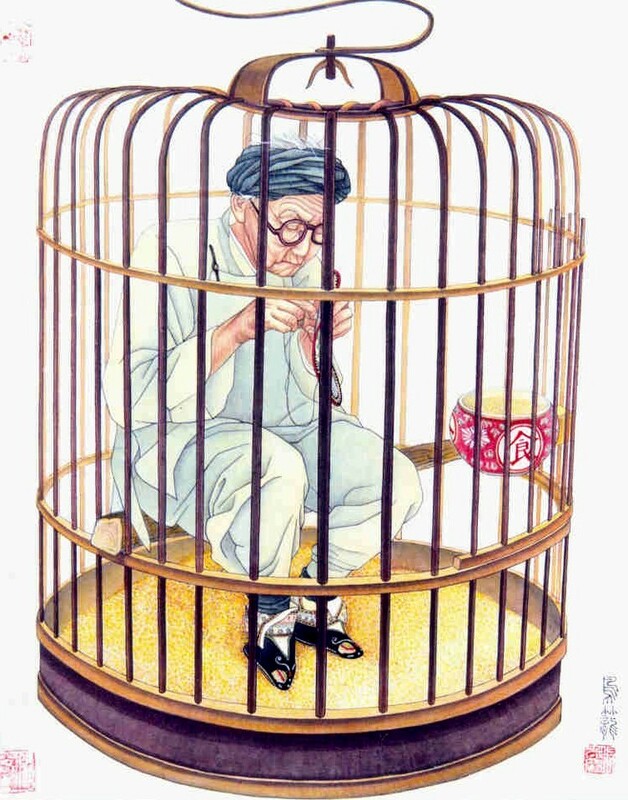 Zhang’s Grandmother is completely confined inside the birdcage with her feet bound, while her mother has a little more freedom but still limited by the mid century communist party. Zhang depicts herself outside the cage with a considerable amount of freedom compared to the first two generations, but still limited by present day ‘one child’ regulations. What I love about Zhang’s work is how she balances the thoughtful perspective and ‘connection’ behind her work with some sense of humor and plenty of elegance. I came across her work not too long ago and she is already one of my favorite contemporary artists. Hong Chun Zhang – Zhang’s personal website. See more of her work. and Sweet Grass Baskets from the Low Country. 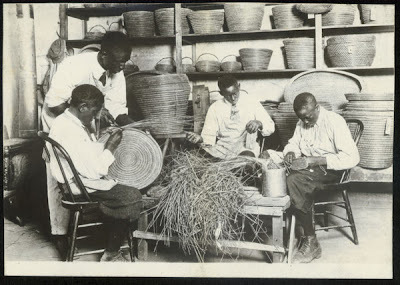 The history and tradition of sweet grass basketry dates back to the 17th century when enslaved West Africans were brought over to South Carolina to cultivate rice in the low country. Originally the task of making the baskets were completed by the men and the baskets served two important purposes. The first being purely functional in helping with household chores and rice harvesting. The second purpose was a cultural connection to their ancestral homes across the Atlantic Ocean. It was not until after the Civil War when the traditional roles of basket making switched from men to women. Since then the women have continually taught the craft from one generation onto the next. It takes a lot of time, patience and creativity to make a single basket. There are no patterns or many, if any, ‘how to’ books; and most basket makers today have a difficult time in explaining the full process. It’s a tradition that one grows up with, learning the skill from a very young age from the elders in the community. Currently the state of South Carolina has gone to great lengths to preserve the heritage of basket making in the low country and there is a community push to preserve the land and marshes where most of the grasses grow from commercial overdevelopment. In the beginning the grasses used for the basket making was Bulrush and Palm, very similar to what the early displaced Africans were familiar with from their homeland. With changing purpose of the baskets from purely functional to more decorative and cultural objects for selling to tourists, Sweet grass became a more popular choice of grass to use as the primary material with other natural grasses for visual and decorative contrast. The sweet grass is cultivated from local swamps and marshes by the family and the finish products are sold from makeshift stands along Rt 17 – also known as Sweet Grass basket highway- in Mt Pleasant, SC. The first of these basket stands was established in 1916 and since the 1930’s they have become a standard stop for tourists visiting the low country and wanting a piece of the local culture to take home with them. I am one of those “tourists” and since 2006 have been the proud owner of my own little basket. I was very curious about the stands and the women making the baskets as their husbands ran the stands and register. I love my little basket and it currently sits on my dresser holding my favorite bracelets. 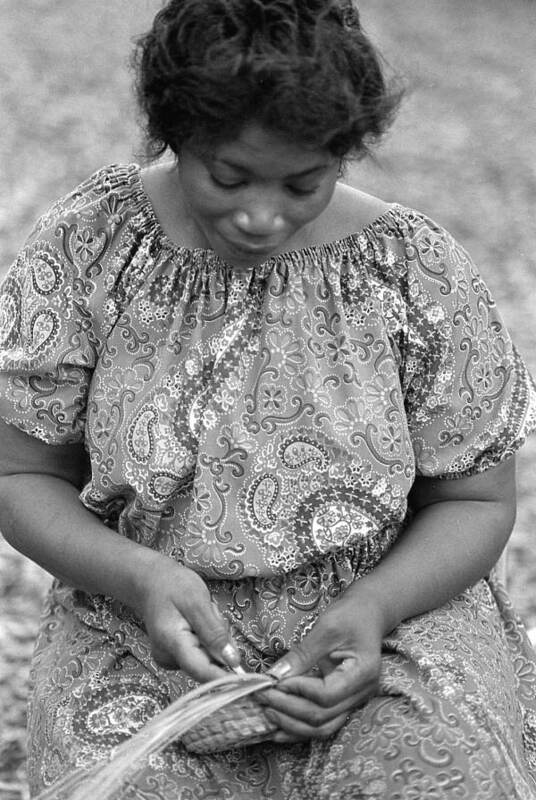 Today of the most notable contemporary basket maker and recipient of the National Endowment of the Arts National Heritage Award, among many other awards, would be Mary Jackson. 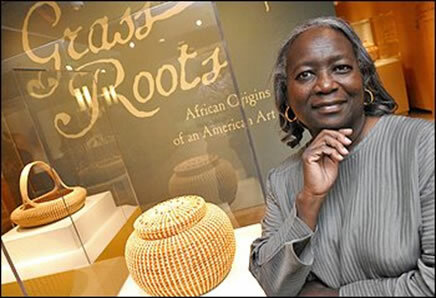 Jackson was born in Mt Pleasant, SC – a community near Charleston- and is a descendant of the Gullah community. Despite the long tradition of basket making in her family and community, she did not begin creating her baskets until she was an adult in the early 1970’s and selling them in the 1980’s. Today she is a very accomplished sweet grass basket maker and her craft has become a full family affair with her making the baskets, her daughter working as an administrator for the family business and her husband and son gathering the grasses. Jackson has exhibited her work in museums across the country and is a cofounder of the Mount Pleasant Sweet Grass Basket Makers Association. Mary Jackson is also an activist in preserving the lands where the grasses grow.Presently there is always a fear that overdevelopment of the land for commercial purposes. The grasses are native, but like other species, they are only able to grow in specific areas. The basket maker’s tradition and livelihood depends solely on the ability of gathering their grasses. If the land is not properly preserve we as a nation will loose a piece of heritage. Please visit the below links to learn more about Mary Jackson and the Sweet grass tradition. Craft in America – Wonderful Vid of Mary Jackson discussing the history of a Fanning basket and her new twist the an old favorite. Mount Pleasant – More history. 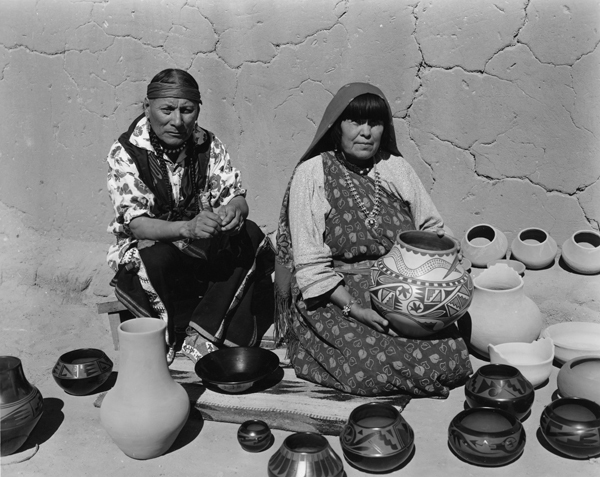 Maria Martinez, born Maria Antonia Montoya, of the San Ildefonso Pueblo, just outside of Santa Fe, NM, can be thanked for her successful efforts in reintroducing the craft of pottery to her people both as a means of creative expression and culture preservation. The craft of Pottery making was fading away by the time Martinez was a young child. 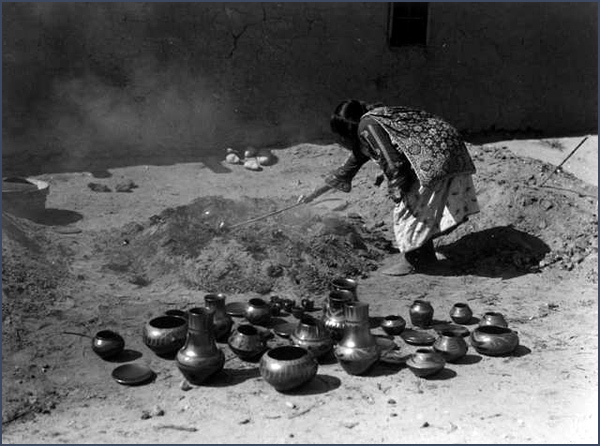 Women of the pueblo no longer needed to make functional pottery for their families because they had access to cheap tins and enamelware. Despite the waning popularity in the craft Martinez still loved to watch her aunt make pottery and over time developed a local reputation for her skills in pottery making the. 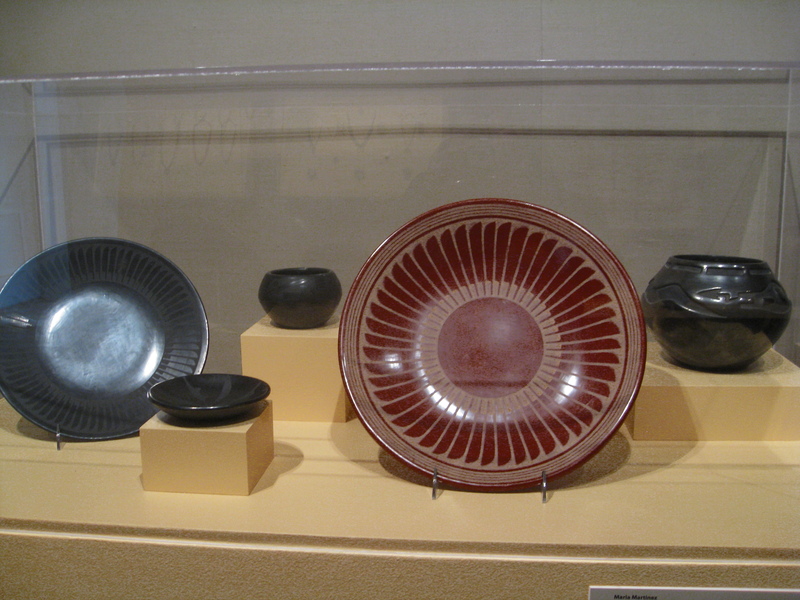 In 1908 the discovery of some ancient pottery pieces were found at an excavation site close to San Ildefonso Pueblo. 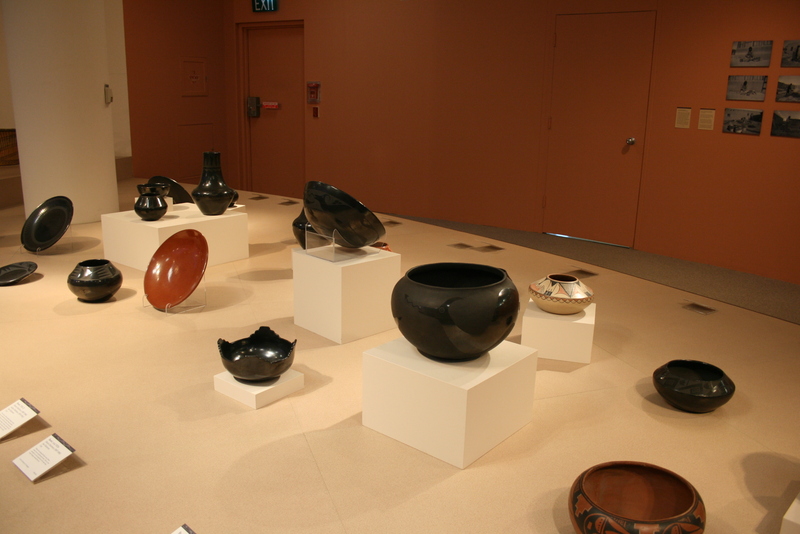 Archeologist and museum director, Dr Edgar Lee Hewett, looking to commission some replicas of the ancient pottery pieces, asked Martinez for her expertise in reproducing similar pieces for his museum. From this request began a husband wife collaboration that would last a lifetime. According to the Pueblo tradition Maria Martinez, the wife, would collect her materials, form the vessels and fire the clay. While her husband, Julian, would paint the vessels. The Martinezs were not the first in the region to create the popular black stoneware, but they did invent a technique of their own that would allow them to have both matt and glossy black finishes on the pottery. This new style would make them famous around the world and would grow into a strong family business. Maria and Julian Martinez collaborated together until Julian’s death in 1948. Afterwards Maria worked closely with her son and daughter-in-law to continue the family business. Her Daughter-in-lay would help with the painting and firing of the pottery while her son would work on selling and marketing his mother’s work. Throughout her career Martinez would graciously share her knowledge with anyone wanting to learn and loved to talk with visitors. Martinez passed away in 1980 and today her work can be seen in museums around the world. I was fortunate to have seen her work first hand at least twice to my knowledge. Once in the Denver Art Museum and another time in the McNay house in San Antonio, TX. You can learn more about Maria Martinez via her official website. Last week while I was driving West from a wind farm near Sioux Falls, South Dakota to the Washington coast for our next job, I passed by the Badlands for the first time in years. The Badlands, located in Western South Dakota along I-90, are one of the most colorful and beautiful natural spaces in the American States. It took me two attempts to see this wonderful place the last time and it was painful to not have the time to stop for another visit this time around. You can briefly glimpse some of the eroded buttes from the interstate, but will not see enough to satisfy a craving. Feeling a bit nostalgic about my earlier trip to the Badlands, and suddenly realizing that many of my photos from that visit are probably gone thanks to a cruel hard drive failure over two years ago, I decided to go through every photo file I had backed up and eventually through my Google Picasa account. Thankfully Picasa had a copy of every photo that I had posted on a former blog of mine. Though I didn’t post everything, but I did post a few images and looking through those precious few I could feel myself back in the national park. It was a bright sunny day, the park had plenty of visitors but not too many, and I was in awe of everything that I saw. While taking in the view from above there was a golden eagle, my first, soaring above the landscape. There were these giant silvery poofs that looked like prehistoric dandelions all over the park. And of course there was the magnificent display of color in the rock formations from the various type of rock material packed together in tight layers. Each layer representing a different time in the long geological history of the region. If you should ever go to this wonderland then you must go when the weather is lovely and the sky is blue to really appreciate the color. This is not a visit for bleak grey days. Its also a perfect place to bring a portable watercolor set. On my way West to Washington for work and we stopped in Montpelier, Idaho for the night and I had a wonderful house adventure for my Rural Decay blog. Early the next morning I took this photo from the parking lot of the truck stop. There is hardly ever a bad view in the open West and the sunrises are extra gorgeous!